The way you perceive a business problem and its causes will direct the actions you take to solve that problem. It follows that If you operate under a false premise about a cause, then your solution will ether make the problem worse, or fail to improve it. Human nature being what it is, chances are that you will then try harder, using the same tools to make reality fit your world view. As in the study of logic, pure logic applied to a false premise, will always yield false results. For this reason, I decided, long ago, to let the numbers do the talking. Primary among the false premises furniture store managers believe is that, “If we don’t sell them the first time we meet them, they’re gone forever.” They are certain that when customers say, “I’ll be back”, it’s a subterfuge to get out of the store without hurting the salesperson’s feelings. Everything about this thinking is wrong, and when business owners think this way they shoot themselves in their proverbial foot. Even before computer-based Up systems made collecting this type of information automatic, I spent years tracking the number of shoppers who came back to my stores, and those of my consulting clients, by simply marking them as “be-backs” on manual door traffic logs. While many shoppers did not return, those that did purchased a very high percentage of the time on that second visit. At this point it will be useful to go through a typical example of how be-backs contribute to sales in most furniture stores, including yours. Note that every shopper is counted every time they come in, because close ratio is NOT calculated on the number of people, but on the number of visits. Assume you have100 sales opportunities. Of these,15 are second timers (be-backs) and 85 are first shoppers on a given project. You close 10% of the first timers, closing 8 sales. On the 15 return opportunities you close 80% for 12 sales. 12 + 8 = 20. All you have to do is to measure this for yourself to prove or disprove this claim. I wouldn’t put it out here for all of you to challenge unless I had verified these percentages many times before. Here’s the big problem for retail managers who believe that it’s first time or bust. They undervalue those prime potential buyers who just couldn’t get their minds around how this furniture will work for them in their room with their needs, and their family, and their other furnishings. Sometimes customers need to THINK about it. When you undervalue them, you fail to take the right actions and do the right things, to ensure they come back to your store and your salesperson. You fail to realize that more business is lost to poor opening of a sale than to poor closing. You don’t value the non-buyers. You do not have aggressive follow-up systems for non-buyers. You don’t give your salespeople the right tools – like Room Planners and e-mail – to stay in contact with those non-buyers. You are willing to spend more money on bringing in NEW shoppers, when the really huge opportunity lies in those who have already responded to your expensive ads. These folks have already visited the store, found things they like, could buy, should buy, but don’t. That’s because high-ticket purchases of fashion-oriented goods are not made easily by some women. They have to be sure it’s the right decision because mistakes are costly and reflect on them. 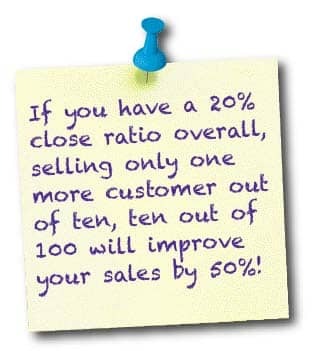 If you have a 20% close ratio overall, selling just one more customer out of ten, ten out of 100 will improve your sales by 50%! Where the heck can you get that kind of improvement with little cost? The problem isn’t with your products, your pricing, your inventory – it’s in the room! Another efficient way to bring first time shoppers back for a second visit, is by staying in contact via email to convey new, pertinent information and follow up with unsold customers. Once you’ve taken the time to run your sales numbers to verify the importance of be-back sales, I suggest that you consider Steven Covey’s prescription to “Begin with the end in mind” – one of the seven habits of highly effective people. What’s the end? It’s not the closed sale – it’s the finished room! Do the right things in the store, in the selling process by seeking first to understand, then to be understood – another one of the hallmark habits of effective people. This is what “room talk” is all about – understanding the customer’s needs and suggesting well-informed solutions that involve your products and that solve your customer’s problems. The worst mistake furniture retailers make is undervaluing shoppers who do not buy the first time in. You already paid with your ad dollars for them to come in. You already should know a lot about them and their homes and rooms. You have a relationship with them through your great salespeople. The most important work salespeople can do is to sell those shoppers who did not buy because there are a hell of a lot of them out there and the work has already been done – if you have a selling strategy that makes sense. Remember this one thing: The one more customer out of ten you need to improve your sales revenue by 50% is NOT among the next new first-visit shoppers you bring in.